• Water & Maintenance: Water until established. Can tolerate some sun. After being established, low- to no- maintenance, except for pest control (see below). • Growth & Spread: Medium growing with a height of around 0.5 m and a spread of 0.5 to 1.0 m.
• Flourishing Season: During the prime summer months pale lilac-coloured flowers are produced. • Characteristics: Smooth textured leaves with a delightful and unique combination of blue, green and grey. 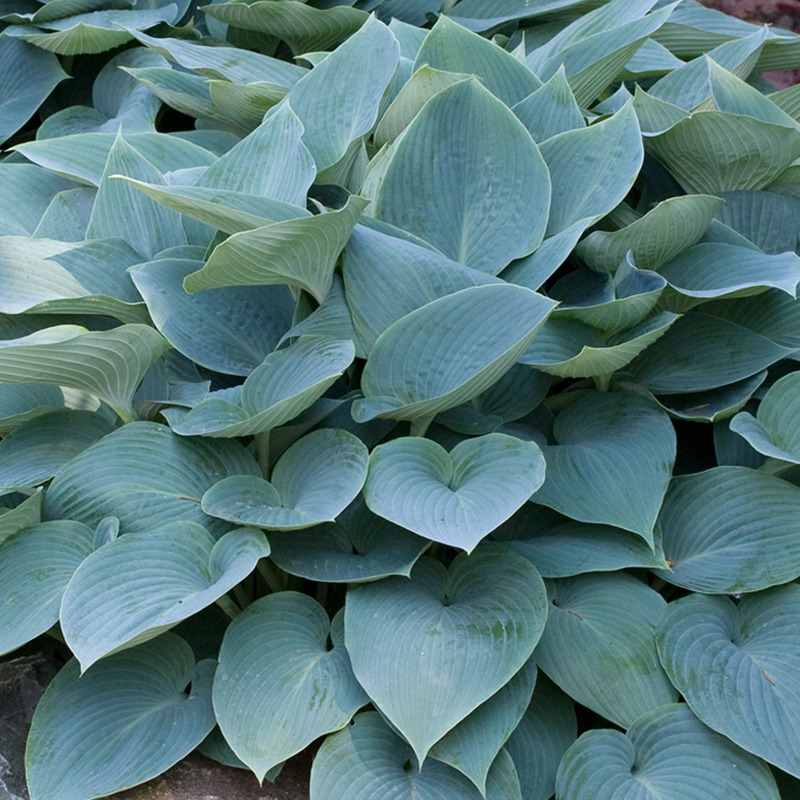 Some of the standout features of this variety of Hosta are the blue-green-grey color of the leaves. Younger leaves will be heavier in the blue tones. The pleasant light-coloured flowers arrive in the middle of the summer and are carried up on a raceme, a skyward reaching stalk with bunches of these bell-shaped beauties. Like most hosta plants, they like moist, but well-drained soil. Also they prefer to be in shaded to partially-shaded areas. These plants grow from a central clump and the leaves spread out to provide a dense, shaded groundcover. Because of this, they are very good to use in border areas to control weed growth. Hostas can be divided every two to four years in order to thin or transplant. Dividing the plants helps to encourage more vigorous growth and allows the plants an appropriate amount of space to fully develop. They are relatively disease-free. Although the Halcyon is more resistant to slugs because of its thicker leaves, it is still vulnerable to slugs and snails. A suggested organic method to deal with these pests, is to this is spray a nematoid-filled solution on the soil around the hostas. These worm-like creatures will organically dispose of these pests.